If only it was as easy as finding a KINKO’s to print them out! So, often we hear the phrase “shot itself in the foot.” So-and-so screwed up again and “shot itself in the foot.” Sadly, when it comes to Mexico, you have to scratch your head. Give it a shake and wonder, if it has as many feet as a centipede. How many times can it cap a round into it’s own tootsies and keep walking? Maybe you’ve already heard the latest. You can’t get a Mexican fishing license in Mexico. Chew on that for a minute. Mexico has no fishing licenses. You must still have a Mexican fishing license. They inspectors are still out there. But, you’ll be hard-pressed to find someone that will be able to sell you one down here. Here in La Paz, at our Tailhunter operations, we normally have licenses to sell. We sell a heap of licenses every year to our clients; our competitors clients as well as walk-in anglers. We don’t make anything on them. It’s a nice convenience for everyone and we’re happy to do it. 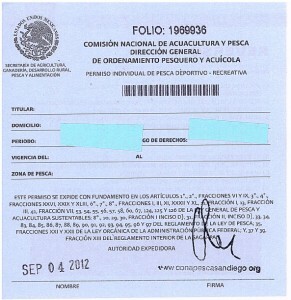 Previously, getting a fishing license was a 2-3 day ordeal and test of stamina and resilience, even here in big La Paz. You filled out several forms. You had to go to the CONAPESCA office. Then off to the bank to pay the fee. Then bring your bank receipt back to CONAPESCA. Big difference from buying things over-the-counter at Walmart! So, being one of the few places allowed to sell the fishing permits in 10 minutes is a wonderful convenience for everyone involved. Several weeks ago, we were informed by CONAPESCA (Mexican Fish and Game) that they didn’t have any more licenses this year. Not just us. Everyone! Loreto. East Cape. Cabo. And not just us in S. Baja. It was the WHOLE of Mexico. We spoke with Tracy Ehrenberg from the Pisces Fleet in Cabo San Lucas and she phoned the main offices of CONAPESCA in Mazatalan. Here’s their “We-shot-ourselves-in-the-foot” story. Try to follow this. According to Tracy, the new head of CONAPESCA simply “didn’t budget” for the printing of enough of the paper licenses to sell for the WHOLE COUNTRY. Think about that one. What no KINKO’s? So, while some smaller outfits or out-of-the-way places might still have a stash of permits, they government is counting on YOU to purchase your fishing licenses online before you come down to Mexico! Fourth, the website is about as primeval like it was built by a first-year intern as a school project. It’s difficult to figure. It makes mistakes. It crashes all the time. It sometimes takes your credit card, but gives you nothing to print out. It’s very frustrating. Several weeks ago when I notified our own clients about the situation, and posted the problem on our fishing reports, I must have gotten 20 phone calls and e-mails a day from livid, confused and frustrated anglers. In fairness, eventually, with enough persistence, everyone got their licenses. It eventually works and it seems that someone there at CONAPESCA has put the website on a larger server. It doesn’t crash as often. But, Mexico tourism didn’t need another SNAFU like this. It’s supposed to be making it easier and more stress-free to visit, not throw another hurdle in the way of a vacation! How many times can it fire a round into it’s foot again? Can you imagine the outcry if all the Fish and Wildlife operations in the U.S. “forgot” to print up enough fishing licenses or hunting tags…and yet still enforced them with inspectors out there in the field and on the water? • Do not be alarmed at the price…it’s in pesos!!! So just divide by 11 or 12 and that’s the rate in dollars and it will show up on your credit card statement in dollars. • If it’s slow or doesn’t work at first, try again later. With this announcement, everyone in southern Baja has to purchase their licenses this way! There’s a third option as well. In Southern California, a number of well-known fishing tackle stores sell them and, if you can’t go to visit, they will take your information over the phone or via e-mail. They will process the form for you and mail you out your fishing fishing licenses. It’s fast, it’s easy. But they have limited amounts as well, and after they sell their stash, they’ll be having trouble getting licenses as well. Also many of the sportfishing landings in Southern California, especially in San Diego all have fishing licenses to sell. That’s another alternative. Most of the time, the website works fine these days. Just persevere if it doesn’t work the first time. There’s also the other aforementioned ways to get your license. Don’t cancel your trip. Just take a breath and know that it’s as frustrating for us down here as well and we don’t want you being surprised when you get down here and there’s no fishing licenses.